This book covers beginning mathematics including . . .
• Sheet Music for "Borrowed Books"
The answers are included in the textbook. 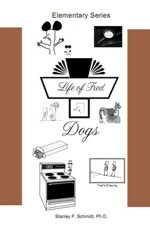 Life of Fred Dogs is a hardcover textbook containing 128 pages. This book is not consumable. All answers are written on separate paper or in a notebook. It is designed to be read with the student. Life of Fred Dogs contains 19 lessons and is designed to take approximately one month to complete.